The Modern Café was open for its last day of business on March 14, 2015. Jim and Patty Grell, who had operated the Modern Café for 20 years, had had their fill, and were moving on from the restaurant business. 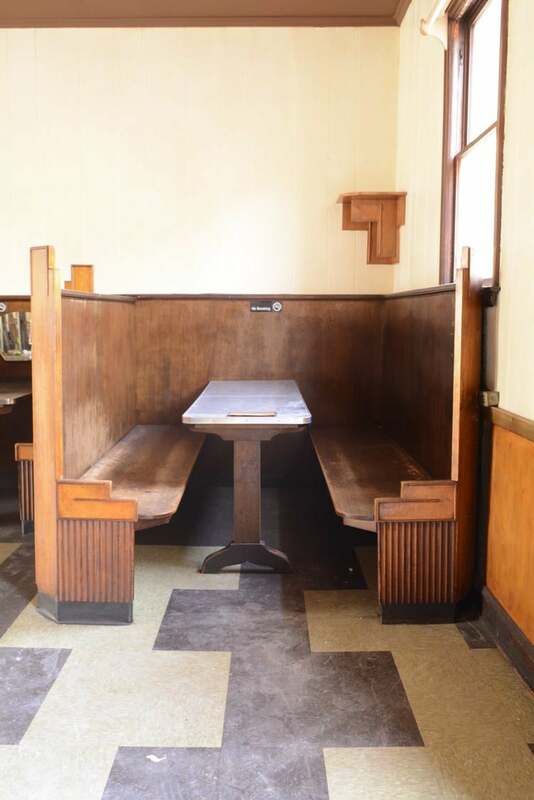 The Grell’s had maintained the style of the restaurant to include mid-century furnishings from the time of the original owners. Prior to the Modern Café, Rabitin’s Café existed on this spot. It began with Stephen and Mary Rabatin, Slovak immigrants who started the café as a family business in 1941. The café included home cooked food, and a soda fountain. The population of the northeast neighborhoods they served included Grain Belt Brewery workers, Sheridan School students, and Ritz Theater moviegoers. When Stephen died in 1948, Mary continued to run the business as well as raise her six children, who worked in the restaurant. Mary died in 1991, and the family sold the restaurant to the Grells, who opened for business on August 8th, 1994. In the 1940’s, the demand for restaurant meals escalated following a rising economy. With the rise of a predominately middle class culture after WW2, there was also a rise in the standard of living. Inexpensive, functional dining spaces emerged and proliferated to cater for more basic eating experiences. On the side of architectural furnishings, new materials were available, as well as new manufacturing techniques, new colors, and new forms. These were more affordable, and mass produced. Techniques and materials that had been pioneered for military purposes afforded designers a great freedom. A lot of the shapes of the Mid Century Modern furnishings were influenced by what could be done with the new materials of the time. Suddenly, the ability to take huge sheets of wood veneer and plywood, and bend them into organic curves encouraged designers to experiment with all sort of furnishings. New ways to stack wood veneer allowed furniture to have stepped forms, as well as curved forms. Molded laminate could be used for counter and table tops. The curves of wood and steel are what shaped Art Moderne design of the mid-20th century. In the Modern Café you can see the use of increasingly narrow and lighter steel in the chairs and chrome edging, lightweight wire rod furniture, innovative ways for bonding wood in the booths, shelves, and benches, and the effort to use less material in the pedestal leg of the stool. The items that we salvage from the Modern Café will increase environmental sustainability. In addition to giving material a new life cycle, deconstructing new items helps lower the need for new resources. Furthermore, salvaged materials are in most cases of higher quality than those that are available now. Salvaged pieces will also typically look more aesthetically close to existing wood than that of new lumber. Salvaged materials give you the ability to think outside the box. You will find items you might have never thought to use because they are no longer manufactured today. We at Architectural Antiques can help you with that. The new owner of the space is Jon Oulman, co-owner of 331 Club (next door to the Modern) and Amsterdam Bar and Hall. The Grells, who had received an offer from a chain, were concerned about leaving the restaurant to someone who knew the neighborhood. Oulman has said that he wants to make sure the laid-back neighborhood vibe still remains intact. The new eatery will also respectfully retire the name and the menu items of the Modern Café.